Son of: Elizabeth Hunt Acklen - Grandson of Capt. John Hunt, "founder" of Huntsville. • Biography of Adelicia Hayes Franklin Acklen Cheatham, Joseph Acklen's wife: "She was the daughter of Oliver Bliss Hayes, a prominent Nashville lawyer, judge, Presbyterian minister, land speculator, and cousin to President Rutherford B. Hayes. Born in Nashville, TN in 1817, she was engaged at age 17 to Alphonse Gibbs when he precipitously died. Five years later in 1839 she married a 50-year old wealthy cotton planter and slave-trader, Isaac Franklin. They were married for seven years with four children (all died in childhood) when Isaac died of a stomach virus while tending to his plantations in Louisiana; the widow Adelicia Acklen was left with an inheritance of $1 million that included seven Louisiana cotton plantations, the two-thousand-acre Fairvue Plantation in Gallatin, Tennessee, more than 50,000 acres of undeveloped land in Texas, stocks and bonds, and 750 slaves. 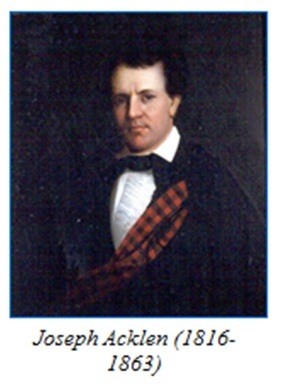 Adelicia married her second husband, Colonel Joseph A. S. Acklen, in 1849. Joseph, a handsome attorney from Huntsville, Alabama, didn't quite sweep Adelicia off her feet; two days before they were to be married, Adelicia presented Joseph with a prenuptial agreement specifying that she would be sole owner and final authority over all the properties she brought into the marriage. The couple began immediate construction of Belmont (completed in 1853), a twenty-thousand-square-foot summer villa, with 36 rooms, including an art gallery, conservatories, lavish gardens, aviary, lake and zoo. The Acklen's with their four surviving children (two died in childhood) lived a sumptuous lifestyle, traveling between Belmont in the summer and their Louisiana plantations in the winter. The Acklen's entertained such notables as President Andrew Johnson, inventor Alexander Graham Bell, socialite Octavia La Vert, philosopher Thomas Huxley, and soldier of fortune William Walker, as well as numerous Confederate officers and political figures. Joseph was a superb businessman and plantation manager, who gave up his law practice to manage the family businesses, to triple his wife's fortune by 1860. Joseph died in 1863 at the Angola plantation in Louisiana, age 47, a carriage accident during the Civil War, and shortly thereafter Adelicia journeyed to Louisiana in an attempt to save the nearly 3,000 bales of cotton stranded on the Acklen plantations. She faced financial ruin when the Confederate army threatened to burn her cotton to keep it from falling into Union possession. She hired a gunboat to take her down the Mississippi River, and first negotiated with the Confederate's not to go on a raid to burn the cotton. Next she charmed the Union to release the cotton to her and to take it by wagon to New Orleans. In New Orleans, the bottom fell out of the cotton market price. Discovering that cotton was in high demand in England, she managed to get her cotton on a ship to Liverpool where it was sold to the Rothchilds of London for a reported $960,000 in gold. • Joseph and Adelicia were married 14 years and had six children but the twins died of scarlet fever. • His son Joseph was an attorney, US Representative from Louisiana, the first game warden for Tennessee, and earned notoriety as legal counsel for the Tennessee suffragettes. • Joseph's early life centered in Huntsville, but after his marriage to Adelicia, his focus shifted to their businesses mostly in Tennesse and Louisiana. 1. Joseph Hayes Acklin, born May 20, 1850 in Nashville, TN; Died Sept. 28, 1938; Married Hattie Leonora Bethell; Joseph was an attorney, US Representative from Louisiana, the first game warden for Tennessee, and earned notoriety as legal counsel for the Tennessee suffragettes. 4. William Hayes Acklin, born September 6, 1855, at Belmont, Davidson County, Tenn.; lawyer; educated at Neuilly, France, at Montgomery Bell Academy, Nashville, Tenn., and a graduate of the Law School of Vanderbilt University, Tenn.; author of "Sterope," "Sketches of Travel;" translator, from the French, of "Essays on Bancroft, Longfellow, Sidney Lanier," resides in Nashville, Tenn Died 1940. • Belmont Mansion Photo Gallery - His home in Nashville. • Belmont Mansion Website - His home in Nashville. • reocities.com - Geneology site listing Joseph in the Third Generation with his wife, Adelicia Hayes, born 1817. It also tells of her connections saying she was a close friend of Mrs. James K. Polk and says she was entertained in the court of Queen Victoria and by Emperor Napolean III of France. • waymarking.com - Biographical information plus a description of the mausoleum in Mount Olivet Cemetery where Joseph is buried.